Success for STA students in academic and arts competitions! 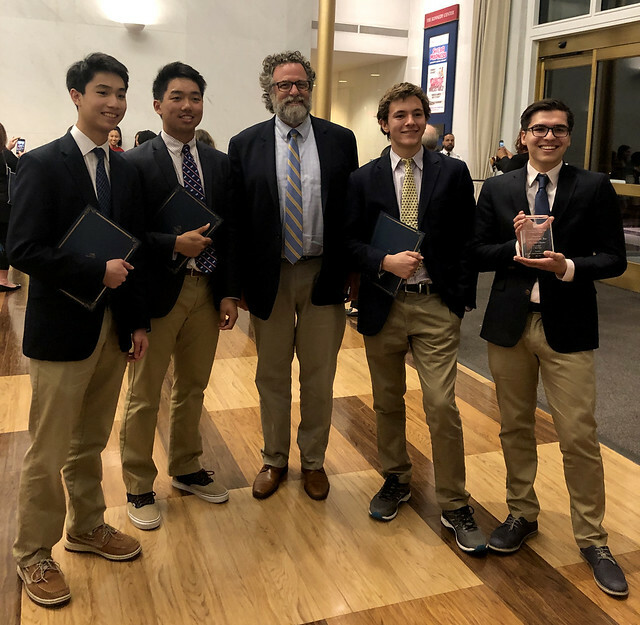 Congratulations to Owen Nguyen ’20, Brandon Torng ’20, Nolan Musslewhite ’20, and Martin Villagra-Riquelme ’20, who were recognized at the Kennedy Center by the National Society of Arts and Letters (NSAL) for their commitment to and excellence in the performing arts. Math Dogs in Forms C, B, and A competed in the MathLeague regional competition at Maryland International Day School this week. The St. Albans team came in first place overall and, in a near sweep, claimed eight of the nine individual awards. Many of the boys will compete at the D.C./Maryland state championship in May. B Former Arjun Patel ’26 recently won the National Geographic GeoBee State Competition for Washington, D.C., and will compete in the national championship in May. Out of 492 submissions from more than 40 schools, the poem “Waiting for Matthew Shepard’s Funeral Service at the Washington National Cathedral to Begin,” by Clark Klitenic ’19, was named a winner in the 37th Annual Parkmont Poetry Festival. Kudos to everyone for their hard work!